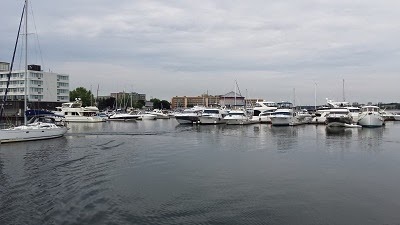 Confederation Basin in Kingston is one of the two city owned and operated marinas and it is located right downtown. We arrived on Saturday and booked a berth for two nights. The busker festival was happening in the park right in front of the marina and on a couple of nearby downtown streets. Staff were friendly and helpful, and being downtown is very convenient to shops and restaurants. Sunday didn’t bring any thunderstorms on the Ontario side of the Lake, but it certainly rained. Given that we had some work to do finishing a proposal due the next day, we were happy to be tied to a dock and able to work. Yesterday, Monday, brought sunshine again. We borrowed a friend’s car to drive to West Marine to pick up a joker valve for the head (toilet) which had started leaking on the weekend. This is a one way valve from the head to the holding tank. Let’s just say it is a really important part in the plumbing system. Nothing was in danger of overflowing as seepage was just slowly back flowing from the hose leading to the tank, but it still was unpleasant to have to pump it dry again every few hours. 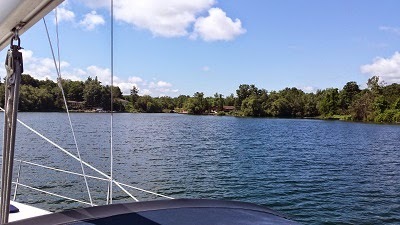 After installing the part, mailing the proposal we had been working on and getting a few groceries, we pushed off dock again. Unfortunately the part we had ordered for our oven has not arrived yet. We will be back in Kingston later this week for a meeting and a wedding so hopefully it will arrive in the next few days. When we left Confederation Basin, we tried to anchor at Beau Rivage, but when we arrived it was quite full. We have gotten a bit spoiled this summer as we have often had lots of room in the anchorages, so we pushed on to Brakey Bay. There were only two other boats in the large bay when we arrived. 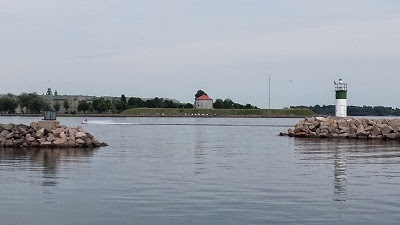 We have seen as many as twenty boats in Brakey Bay. This morning it was raining and the other two boats left early. The sun has now come out and we have the bay completely to ourselves. Another beautiful day in the Thousand Islands.